About 15 years later, the Choctaw people learned about the Irish suffering from the Great Potato Famine and scraped together $170 to send to alleviate their suffering, a gift memorialized in 2015 in Ireland with a beautiful sculpture. Ireland’s Great Potato Famine started in 1845 and ran for six years, according to an article posted by the Choctaw Nation, Friendship Through Famine. It painted a picture of colonial oppression of the Irish (similar to what indigenous people suffered in the United States). When the emaciated [Irish] peasants looked to their colonial masters for support, the British minister for famine relief responded that the events were, “a mechanism for reducing surplus population… the selfish, perverse and turbulent character of [Irish] people.” During the famine years, Britain exported out of Ireland approximately £500,000 of government produced food. The fact that it had been British policy to constrain the Irish to tiny plots of barren land suitable only for growing basic tubers was conveniently forgotten. When famine hit, the Irish would starve. It was an inevitability brought on by nature but predetermined by acts of man. … the long march from Mississippi to Oklahoma had made the Choctaw acutely sensitive to the anguish of those desperately in need, and when news arrived of what was happening in Ireland, a group of concerned tribal members promptly rallied together to raise funds for those Irish still clinging on to life. 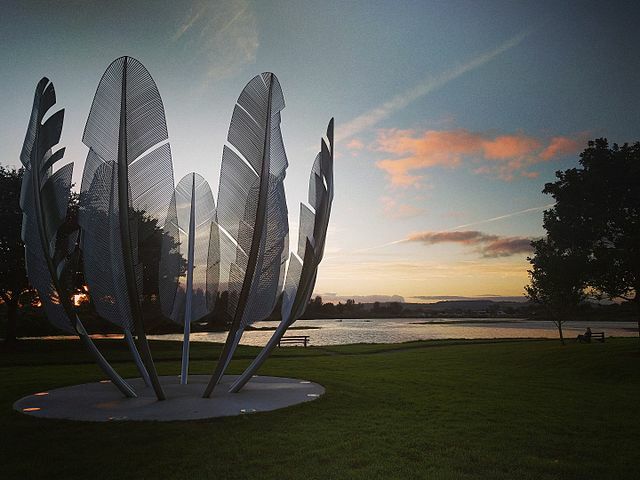 In 2015, the sculpture “Kindred Spirits” was erected in Bailick Park in Cork County to commemorate the Choctaw gift. “The sculpture consists of nine 20-foot … stainless steel eagle feathers arranged in a circle, no two feathers being identical, forming a bowl shape to represent a gift of a bowl of food,” according to the Wikipedia description. It said the Choctaw’s $170 donation in 1847 would be equivalent to somewhere between $4,600 to as much as $20,000 in today’s dollars. Wow. I am grateful to know this as two of my beloved nieces are Choctaw and German-American women. How beautiful this story is. Thank you. Saw a beautiful painting honoring this gift too – in Donegal Castle, Ireland. I have a photo of it. If you send the photo to mplsscott@gmail.com I will include it in the post. Please send your name, too, if you would like a photo credit!